Whether you have waded through the monotonous and labor-intensive journey that is a job search and ended up with an offer or two or you have been offered a promotion at your current company, it’s important to remember that you haven’t quite finished yet! Especially at the point of salary discussions and offer negotiation, you need to be prepared, and to keep your head. It may be tempting, especially as someone trying to break into the data science world, to jump on the first offer given to you. But that’s not always a great idea. In this article, we’re going to take an in-depth look at how to approach offer negotiations (whether it’s a new job offer or salary discussions at your current job) to be sure that you get what you deserve! Always do your research prior to interviewing with the company. Is this a startup or is this company established? This will determine how you can negotiate a potential offer. What will career growth look like at this company? Is there room for upward mobility or even flexibility on potentially changing teams/functions in the future? Take into account key technologies or platforms they are using. Do these technologies/platforms sound interesting to you? Can you see yourself either learning them quickly or actually enjoy using them? Consider contract vs. full-time vs. apprenticeships/internships. Know your worth going into offer negotiations. Do research on the average salary for the role you’re interviewing for in your location. ALWAYS NEGOTIATE — Talking about money is always a bit uncomfortable, you don’t want to sell yourself short or come off as greedy, but companies expect you to negotiate, so come prepared. If you’re interviewing for a startup, start researching equity. A lot of startups offer lower salaries in turn for higher equity percentages. You can negotiate salary/title/responsibilities even if you’re looking at a promotion or upcoming review in your current company. Offer Negotiations are not just about money. Always consider the “big picture” when looking at offers. Will you have work life balance, i.e. ability to work remotely, etc.? What does the commute look like? Are there any additional costs or perks to working with this company? What do their benefits look like, will you be paying out of pocket for healthcare expenses, etc.? What does the company culture look like? Do the company’s values align with your own in terms of diversity and inclusion, charity, etc.? Now let’s take a deeper dive into these crucial topics. Positions in the data science field are in high demand right now, and probably for the foreseeable future. Whether you are aiming for a role as a data scientist, data analyst, data engineer, or something else, it’s important to know that demand is significantly higher than supply for these types of positions. This gives you some leverage in offer negotiations. Know who you’re dealing with. Typically, bigger companies will be able to offer a bigger compensation package than your average startup. This may make their offer more attractive, but it’s worth remembering that startup jobs come with their own perks. They may not be able to pay you a huge salary, but typically you get some kind of equity (an ownership share in the company, like a stock option) as part of your package, and a lot more creative flexibility in your actual job description. Your own finances: What is your current financial situation? Startups can be awesome places to work, but statistically speaking, most startups fail, so your chances of losing your job at a startup are higher than with an established company. If you don’t have any savings or a backup plan, you’ll need to consider the risk of job loss carefully as you’re assessing job offers. Equity: Most startups can’t afford big salary and benefit packages, but they usually compensate with culture and equity. Equity is often proportional to how early you’re joining a company; the earlier you join, the greater the risk, which typically means you’ll be accepting lower pay but given a greater share of equity. That’s something you’ll want to assess when you get your offer — how much equity have you been offered, and is that reasonable given the stage at which you’re entering this company? Healthcare: If you’re based in the US and have a family or even health issues that you need good insurance for, startups may not be the best bet. Companies that are more established will typically be able to offer better health coverage in addition to a better salary. If you’re located in a country with affordable or universal healthcare, this may be a less significant factor. Job Security: No job is guaranteed safe (layoffs can happen anywhere), but typically more established companies are more stable and less prone to encountering sudden financial problems, and you’re thus less likely to find that your job has been suddenly changed (or eliminated) overnight if you’re working for a bigger company. Growth and Flexibility: It’s always appealing to be able to have some flexibility and growth in your job description, and with a startup there is often more room for that. 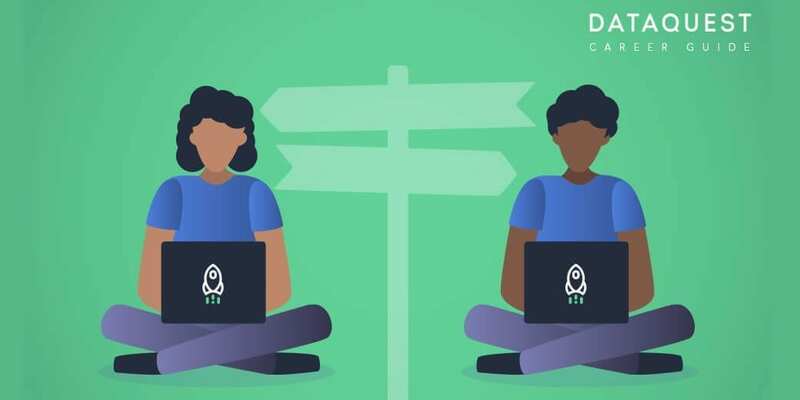 Many times, tech roles (including data positions) are the first positions hired at a startup, so you have a lot more room for growing within that role and the freedom to bring your creativity and ideas to the table more frequently. At big companies, there is typically less room for growth as the people in leadership have probably been there for a while and aren’t going anywhere. You may not have as much room to collaborate with different people and teams at an established company. Company Culture: This varies from company to company, but typically startups have a more free, relaxed company culture, and they’re more likely to be open to things like flexible working hours, remote work, unlimited vacation policies, etc. Larger, established firms tend to have less flexible cultures, and you’ll need to be willing to play by whatever rules are already set in place. If you’ve gotten a job offer, you obviously have some of the key skills the company is looking for. But many people don’t think long term what their new job description could mean for their next job. Are the skills and tools you’ll be using in this role going to be valuable and applicable to other jobs in the future if you decide to leave? Is this new role a step up, or a step into using some tools, technologies, and techniques, that will advance your career? Obviously, data science skills and programming skills are in high demand. But you need to know what exactly you’ll be working on, and consider how it will affect your career in the long-term. Will you be able to gain new skills and experiences that will help you in your future roles? It’s a good move to stay connected to the current and future tech trends, so that you know what is and will be relevant for your own growth. Following sites like TechCrunch, Wired, and Techradar can help you stay in the know. What will my day to day look like? Will I be working with any other teams across the business orgs (finance, HR, legal, etc…)? What kind of tools/technology/platforms will I be working with on a daily basis? The kind of work you’re going to be doing will also affect the way you are going to get paid. Many technical positions, including some data-science-related jobs, are contract-based. This means that you will most likely get paid on an hourly basis, rather than with a yearly salary. Usually, working as a contractor means can ask for a little bit more, because benefits typically aren’t included, or are expensive. In the US, contract offers can be on a W2 or 1099. Most people prefer a W2 because this means the company will take taxes out for you. With a 1099, you will be paid your full salary with no tax deductions, and are responsible for paying quarterly estimated taxes yourself. Tax situations will vary from person to person, you’ll need to spend some time researching your own personal situation to ensure that you’re setting enough aside each month to cover your taxes and don’t get caught with a large bill due during tax season. It’s also worth noting that many people feel contractors don’t always get the same kind of treatment as full time employees. You may not be invited to participate in company events, for example. You’re also not going to be eligible for any sort of promotion, and if financial trouble arises, contractors are often among the first expenses to get cut. On the other hand, you may be able to make more money as a contractor, and you’ll probably have more freedom in terms of your working habits and hours (as long as the work you’re contracted to do is finished on time). Another thing to consider, especially if you’re trying to break into the data science field from a different industry, is looking into apprenticeships and internships. These kinds of positions can let you get your feet wet first before committing to a full-time role. If you’re eligible for one, it’s worth considering even if you’ve also got a full-time offer. A great internship could help you get some relevant experience onto your resume fast, making it easier for you to get a much better full-time offer in a few months, when the internship has concluded. You may also be able to turn an internship into a full-time position if you impress your employer. Internships are typically for three months, while apprenticeships are for six. Apprenticeships also typically involve a training portion and the understanding that you will be brought on as a full-time employee at the end of your apprenticeship period if you’ve done a good job. The downside of both internships and apprenticeships is that the pay is typically low and non-negotiable. That doesn’t mean they should be ignored, however, since they can put you in a better position to earn a larger paycheck three or six months down the road than you might be able to find in a full-time position currently. Money can be uncomfortable to talk about. When you are in the midst of offer negotiations, though, you _have_to be able to have a smart and direct conversation about money. The best thing you can do to prepare yourself for this conversation is to know your market rate ahead of time. Your market rate is the average salary is for the position you’re aspiring to get, in your general location. Glassdoor, Indeed, and LinkedIn all have salary data that can be sorted by country or city, and looking at all of these should give you a decent idea of what you can ask for in a salary negotiation. Remember, though, this is just a point of reference that reflects the local average. Your market rate is not necessarily the number you should aim to settle on. It is a tool you can use to justify negotiating, especially if you’re given an offer that falls below average for your role and location. Having a walkaway salary in mind will also help with negotiations. Your walkaway rate is essentially the minimum you need to make in order to maintain your average cost of living (rent/mortgage, groceries, bills, etc.). Be prepared to “walk away” from an offer if they can’t get you to your minimum salary requirement, and don’t count on the promise of future raises. Assume that what’s in the written job offer is what you’re getting and make your decision based on that alone. It’s never good practice to accept or decline an offer right away. Companies expect you to negotiate; they won’t rescind an offer just because you don’t accept right away. Typically a verbal offer is given first then you will receive a written offer (email) that states salary or contract rate. Once you have seen the company’s initial offer, that is when you start negotiations. It is best to respond to the offer within 24 hours, even if it’s just to say that you have received it and are reviewing it. When you have looked through the entire offer — benefits, paid time off (PTO), perks, etc. — you go back to them with your proposed changes. Keep in mind that you can ask for changes to anything, not just your salary. Whatever you want to change should be listed all together and sent once, though. Don’t first ask for a raise, then ask for more PTO after the raise is granted, then ask for something else after that. Companies do expect you to push back and they want to negotiate, but they don’t want a dragged-out negotiation process and they don’t like to keep going back to revise their offer over and over to address new requests at each stage. That’s when companies become more likely to rescind offers. Offer negotiations with startups may be a bit different in that there’s likely to be less flexibility on salary than at a big company, but more flexibility on other aspects of your package, particularly equity. Do your research up front, and don’t be afraid to ask for more equity, a better job title, or other perks that might help compensate for a lower salary. Remember, though, startup equity is typically restricted, and you’re unlikely to be able to cash in your shares unless the startup is sold or is listed on a public stock exchange. If the company fails — and most early-stage startups do — your shares will be worth $0 regardless of how many you negotiated. Don’t trade real money for shares unless you genuinely believe in the long-term viability of the startup. If you haven’t applied for a new job, you might still be eligible for a raise or promotion at your current company thanks to your new data science skills! Either way, most of what’s been covered above applies: you should be preparing for offer negotiation. It can be tricky to negotiate salary in a promotion because your employer knows how much you’re currently making. But you do have some advantages you can leverage: you have already been working for the company, you don’t need to be trained, and your employer will save money and time by retaining you (finding, hiring, and training a new employee is expensive). Otherwise, the same rules apply. You should still figure out your market rate, and you can use that number in salary negotiations. If your company has a transparent pay scale (or your coworkers are willing to talk money with you), you may also be able to leverage what you know about how the company pays other people in the position you’re being promoted to. Don’t forget that if you’ve gone through a program like Dataquest, you have gained new and valuable skills. You are bringing more to the table than you were previously, and you can definitely bring this up in negotiations. Sometimes managers won’t budge on salary even if you’re up for a promotion or did really well in your review. Keep in mind that you can always ask for other benefits like a better-sounding job title (job titles can be extremely important in career progression), remote work days, more or less responsibility, more PTO, or a guaranteed salary review later down the line. Keep in mind, also, that you can look for options elsewhere. If you’ve been offered a promotion or gotten a great review without being given a raise and your pay seems to be below your market rate, that may suggest that your current employer isn’t paying you what you’re worth, and you ought to look elsewhere. Do you have to relocate? Relocation can be both frustrating and expensive, and of course, moving to a new area may mean moving away (or towards) family and friends. Many companies offer lump sums to help with relocation costs, but you can do your own research and see how much it’s actually going to cost you. This is a factor you can bring up in negotiations, but more broadly, when considering an offer, take some time to think about all the ways your life might be different if you moved. If you love climbing mountains, a job in Kansas might not be worth it even if you have gotten a great salary offer. What does the commute look like? Even if you are getting more than expected in terms of money, will you be spending three hours in your car everyday battling traffic, or squeezed into a packed subway car? What will your expenses look like in terms of gas money and parking? How will your commute affect wear and tear on your vehicle? Does this company allow people to work remotely? Many companies are heading in that direction as it reduces costs, but if they don’t, remote work is another benefit you can sometimes negotiate (i.e. one or two remote days per week), particularly if the company won’t budge on salary, or if you’re up for a promotion or review. Here’s your argument: you have proven yourself as a good, reliable employee, so now you deserve some flexibility in terms of how you get your work done. PTO (paid time off) is a benefit you should negotiate, but it’s also just a factor to consider in tandem with the other details of a job and your life. If the company offers unlimited time off, how much time off are you actually likely to take? The offer with the highest number of paid days off may not be the best offer for you, depending on your work habits. Perks: If your company offers non-insurance-related benefits or perks such as gym memberships, professional development funding, free massages, etc., you should also be considering these in your decision, and you may want to use them as negotiation tools. If you’d rather just have a higher salary than those additional perks, you can simply ask the company to waive those perks and tack on x amount to your salary. Conversely if they can’t budge on salary, you might be able to negotiate for improved perks. Job Title: Many people forget that a job title is negotiable. A better job title can lead to all kinds of benefits later down the line in your career, so it’s important to consider now how the job title for the position you’re considering might affect your career. If you want to negotiate your job title, bring your achievements skills to the table as an argument. Don’t discount this; even if you can’t get a salary bump, having a better job title in this position could mean it’s easier for you to command a much better salary in your next position a few years down the line. Company Culture: Beyond the money, what is this company like? Do you think you would enjoy working there? Did you like the people you met during the interview process? Do you think you would feel included, comfortable, and safe at this company? It’s easy to get caught up by salary numbers, but in the long run, a pleasant company culture that makes work life fun is often worth accepting a lower salary for if the alternative is a higher salary in an unpleasant workplace. Company Values: You may also want to consider your personal values, and whether this company reflects them. For example, does this company make diversity and inclusion a priority? Does this company participate in volunteer work/philanthropy? Does this company offer professional development or empathy training? Is this company environmentally friendly? What’s It Really Like? You’ll have gotten some idea of what each company is like during the interview process, but company reviews on Glassdoor can also be an illuminating source of inside information. You can also reach out to current and former employees on social media like Twitter or LinkedIn to ask questions. If you’ve made it to the point of getting a job offer (or any other salary negotiation) it’s also important to remember that this means the company wants to hire you. That’s a great sign, and it means that even if this job doesn’t turn out to be right for you, you’ll be able to find something else. Don’t be scared to negotiate, and don’t be scared to walk away if you haven’t found the right fit. Don’t focus exclusively on the salary offer; look at the “big picture”: benefits, work-life balance, commute, company culture, title, job duties, future prospects, etc. Assessing and Negotiating Job Offers — You are here.